Shernhall Street, Walthamstow, E17 3EA. More information on this event will be coming out very soon. Sign up to hear about our plans – just head for our home page and then find and click the ‘Follow’ button on the right of the screen and fill out the details. Wood Street Buskers & BBQ Evening: Community Event in the Old Station Yard (opposite Wood St Station). Wood Street Wild West Family Fun Day: a community Summer Event in the Woodside Academy (Forest Site). Christmas Fayre: a Community Event at St Gabriel’s Church & Family Centre. 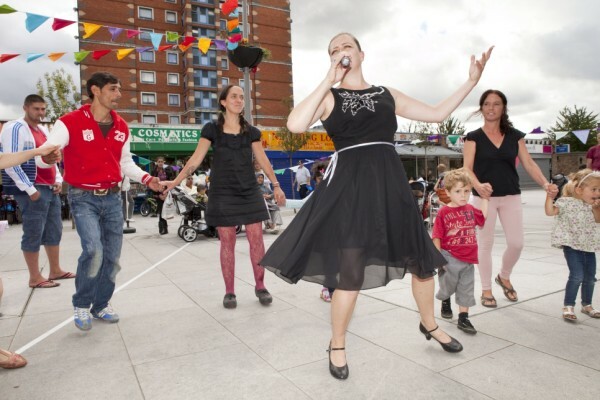 Wood Street Village Fete: a community celebration of St George’s Day in the Wood St Plaza. Details here. Christmas Fayre in the Wood Street plaza. Details here. Family Fun Day in the Wood Street Plaza. Read more here. Celebration of the play area reopening. Read more here. Small Business Saturday in the Wood Street Plaza. Read more here. Family Fun Day. More details here, and detailed entertainment programme here. Free evening film screening and fiesta-themed event. More details here. Party on the Plaza, Wood Street Plaza. Read how the Party went here. Read the programme here. Wood Street fun day, Walthamstow Cricket, Tennis & Squash Club in Greenway Avenue. For more information see this post.